Crêpes made with skim milk, flour, and cooked white rice; topped with lemon flavored yogurt, white rice and fresh fruit. Beat together egg whites, milk, and melted margarine in a small bowl. Stir in flour and sugar until smooth and well blended. Stir in cooked rice; let stand 5 minutes. Heat 8-inch non-stick skillet; coat with cooking spray. Spoon ¼ cup batter into pan. Lift pan off heat; quickly tilt pan in rotating motion so that bottom is completed covered. Place pan back on heat and continue cooking until surface is dry. Turn crepe over and cook 15 to 20 seconds; remove from pan and set aside. Continue with remaining batter. 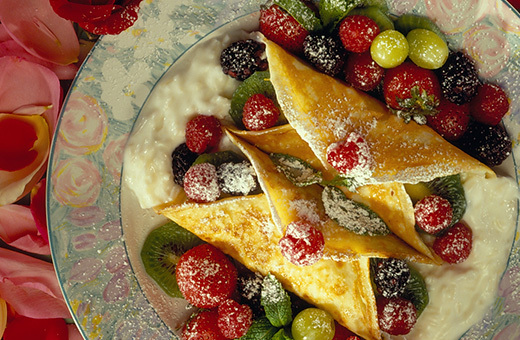 Combine lemon yogurt and rice; spread each crepe with filling, top with fresh fruit. Roll crepe and sprinkle with powdered sugar.